Bocce ball is one of the classiest backyard games to play this summer. It has ancient origins and requires a sophisticated gentlemen’s etiquette. Bocce is the perfect game to teach kids healthy competition rules as well as to have fun with your friends. All you need is the best bocce ball set to get things started. The GoSports 90mm Backyard Bocce Set is undoubtedly the best bocce ball set on the market. It’s perfect for beginners, although experienced players will also be satisfied while using it. Coming with balls of four colors, it’s also ideal for larger groups. This complete set comes with eight premium high gloss resin balls with a diameter of 90mm and a white pallino of 40mm. In this variant, the game is perfect for players over 12 years old and to play on bocce court, sand, or grass. For younger kids as well as for those who want to play on different surfaces, the manufacturer also proposes a version with soft rubber balls which can also be used on hardtop, blacktop, or carpet. Due to this possibility, GoSports gives players of all ages the possibility to enjoy the game either outdoors or indoors. We also like that the balls come in a stylish canvas bocce bag that is perfect for transport and storage. Backed by manufacturer’s warranty and coming with a 100% satisfaction guarantee, this set is no doubt one of the best you could buy. Another excellent bocce ball set that caught our attention is the V3 DLX by Playaboule. This one comes with an exclusive patented ball design that incorporates a LED light into the ball. Due to this system, you’ll be able to enjoy bocce 24/7, either during the day or during the night. Ideal for those who’re serious about their game, this light-up bocce ball set is one of the few that respects the US Bocce Federation ball diameter. It gives a professional feel thanks to the 107mm balls which can be used on most surfaces. At 50mm in diameter, the target ball also respects the regulation size, enhancing the game experience even more. Included in the pack is also a meter that allows you to draw perfect foul lines or build the right bocce ball court. Furthermore, everything comes in a branded carrying bag with an external front pocket. Bringing an excellent value for money, this is a set that can truly enhance your camping trip. 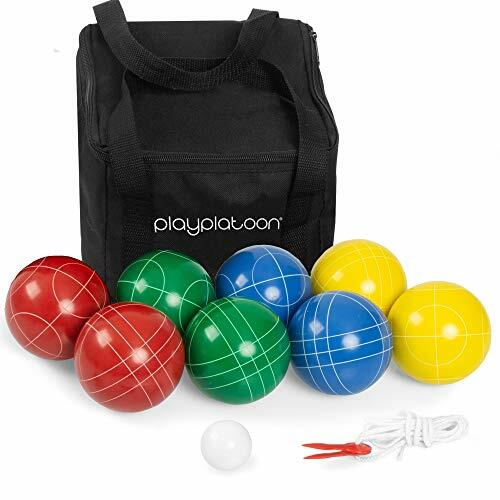 If you’re looking for a more affordable option or just an alternative to the two sets above, check out the Play Platoon Bocce Ball Set. This one comes with premium balls made of resin and developed to resist crack and damage. Each ball measures 90mm in diameter, the right size for youngsters and beginners. As you could expect, the set also includes a measuring rope and pallino, as well as a free carrying case. 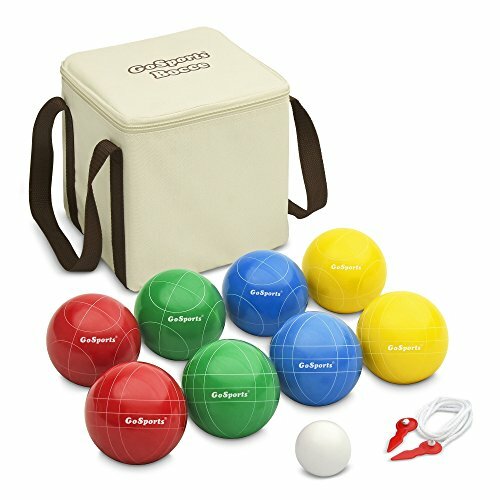 This bocce ball set is ideal for small and big groups alike, providing hours of entertainment to up to eight players. It’s also suitable to use in most environments and on most terrains, including sand and grass. Play Platoon also comes with a 1-year manufacturer’s warranty which you can extend to a lifetime warranty by simply registering the product on the company’s website. A risk-free purchase and attractive price point make this bocce ball set one of the best if you’re shopping on a budget. 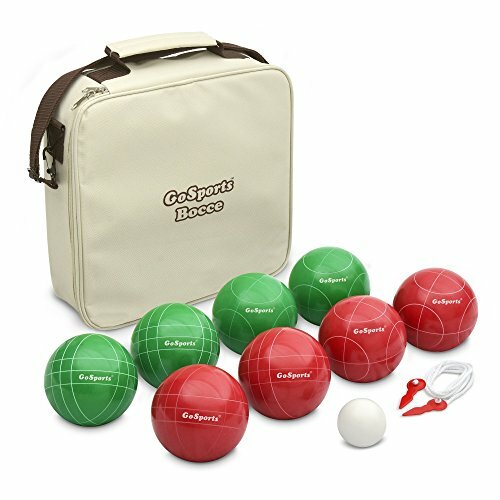 Professional bocce ball players who’re looking for a casual set to have fun with friends or family will undoubtedly appreciate the GoSports’ official size set. It comes with eight balls, four of each color, with circle and square markings, each of which measures 100mm in diameter. The regulation weight of 2lbs and 5oz also allows for realistic gameplay in your own backyard. The 45mm white pallino also complies with the official regulations, while the premium construction of the pieces is unrivaled by all other brands. Like all GoSports sets, this one also comes with manufacturer’s warranty as well as a 100% satisfaction guarantee. Respecting all official regulations and coming in a classy carrying bag, this is the best bocce ball set for the pros. 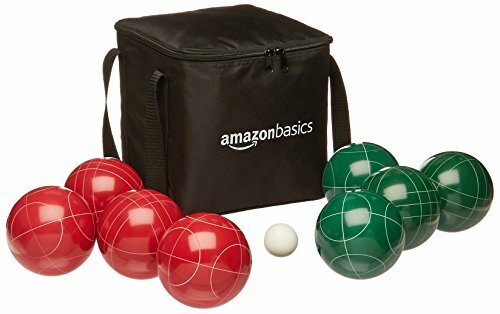 Avid players shopping on a budget may be satisfied by the quality of the AmazonBasics Bocce Ball Set. Coming in two variants, it is suitable for players of all ages and addresses casual players, beginners, as well as professionals. The variant that convinced us has official 100mm balls that come in a set of four green and four red. The set also includes a white pallino and a measuring device you can use to create the perfect bocce court. These balls are made from a poly-resin composite that increases their strength and longevity; with these components, the set is suitable for ages of 14 and up. It even comes with a carrying case you can use for storage and transport. Coming at a price that won’t break the bank and suitable for most players, this is no doubt an excellent alternative to all sets above. Whether you’re a casual player or a pro, there are a few things you should weigh in if you want to buy the best bocce ball set. The most important thing to consider is the balls. You must check not only the material they are made from but also their size and weight. In terms of materials, you can pick from either resin or soft rubber. Resin: Is a plastic composite known for its strength and durability. Many sets containing resin balls respect the standard bocce weight and size, but they are rather heavy. That’s why most of these sets are suitable for players 12 and above. Soft rubber: As its name says, is a soft material suitable for players of all ages. These balls are usually a tad smaller than resin balls, but they can be used both indoors and outdoors and on all types of terrains. Besides materials, you must also consider the size and weight of the balls. According to regulations, bocce balls must have approximately 107mm in diameter and heft of 2lbs and 5oz. Obviously, this size and weight might be unsuitable for some players, either youngsters or seniors. Luckily though, many sets come with smaller and lighter balls, usually measuring anywhere between 74 and 90mm in diameter. Besides material, weight, and size, you must also think of the colors. Bocce is a game for two single players or two teams. That’s why standard sets come with eight balls, four of each color. The official colors of the balls are red and green, so if you want to look like a pro, you could opt for these. To differentiate the balls in case you’re playing in teams, two balls in each group of four have different marks. The standard says two balls should be marked with squares while the other two with circles. Lower-end and recreational bocce ball sets may come with eight balls of four colors (two of each). These are great if you want to play against three adversaries instead of one. However, even if these sets are great for backyard fun, they have nothing to do with the official sets. Storage is an important thing to think of when picking a bocce ball set. Not all of them come with boxes or carrying cases, but we strongly suggest getting one that does. A carrying case is more practical than a box, allowing you to also transport the game. All sets featured on our list come with stylish carrying bags with straps, some of which even have additional storage pockets. Because the term bocce ball determines both the ball itself as well as the game, manufacturers interpret it to their own liking when creating the sets. That’s why you shouldn’t assume that any bocce ball set comes with all necessary for playing. Some may come strictly with the eight bocce balls, and these are pretty much useless if you also need the pallino and a measuring device. To make sure you get all you need, check the product’s specifications and only invest in those sets that come with all you need to play straight out of the box. Some sets may also include a set of bocce game rules, and these are great to have if you’re new to bocce ball. You may be the fondest game player, always respecting standards and regulations, but it’s still impossible not to notice the array of “modern” bocce balls on the market. Such as for instance the fancy ones that come with integrated LED lights. While these balls have nothing to do with the real game, they can enhance your backyard fun. These balls let you play at any time of the day or night, making bocce the go-to activity even after the sunset. Knowing what makes a bocce ball set may not suffice when it comes to choosing the best. There are a few other things you should consider before buying. Are you getting the game for recreational purposes or to train for a tournament? In the first case, any bocce ball set can satisfy your needs. In the latter, get a set that respects official regulations, as you’ll have the chance to get used to the size and weight of the real balls. Resin sets are perfect for adults, but if you’re getting the game for kids, consider one that comes with rubber balls. The resin may not only be too heavy for a kid to lift and throw, but it may also cause injuries if the kids hit themselves or the others. Resin bocce balls are designed for use on sand, grass, or regulation bocce ball courts. Solid surfaces, such as concrete or gravel, could damage the ball when tossed. They are also unsuitable to use indoors, as they may damage your hard floors or have a poor performance on carpeted surfaces. Rubber balls, on the other hand, are suitable to use on all surfaces. They are not damaged by a hard surface nor bring any damage to hard floors. They also have an impressive performance on carpeted surfaces, allowing you to play either indoors or outdoors. Bocce ball is one of the best backyard games. It has a strong history behind and is ideal for players of all ages and from all walks of life. 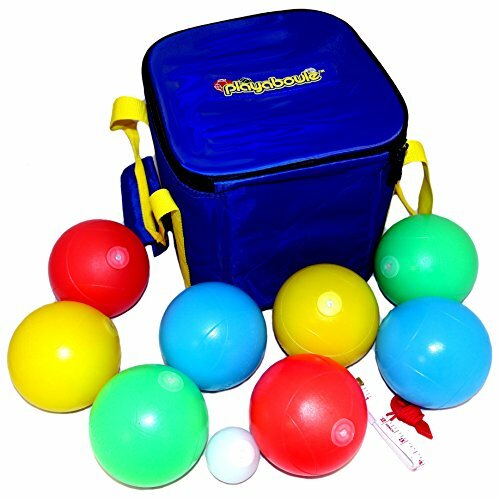 Whether you want to play with your buddies or with kids, it’s also quite easy to find a bocce ball set that meets your needs. From sets with soft rubber balls to high-quality resin ones, the sets on this list bring excellent value for money and address casual, beginner, and experienced players alike. All you need to have loads of backyard fun this summer.